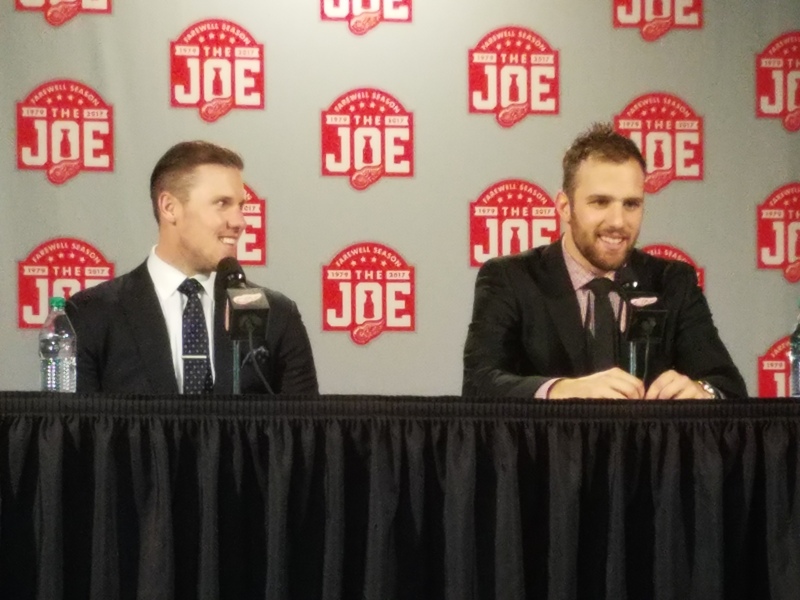 It was a special night at Joe Louis Arena for many reasons. It was most notably, the final game at the storied building. It was also Henrik Zetterberg’s 1,000th game. But, Riley Sheahan added another reason. It was a rough season for the forward. He had not scored in 79 games this season, coming off a career-best 14-goal campaign last year. Many had a feeling that he was saving that first goal for the last game. It turns out, he had two goals. Just 7:09 into the first period, he scored the game’s first goal after he wristed a shot in close on Devils netminder Cory Schneider. Frans Nielsen had the primary assist. It had been a full calendar year since he last scored. Yes, 365 full days. The website “didrileysheahanscore.com” kept track of that unfortunate stat. It was the first of four goals the Red Wings would score in a 4-1 victory. The last of those also belonged to Sheahan. The puck skated across the blue paint right to the tape of #15 and he wasted no time jumping on the loose puck. All of his teammates were elated that the long-awaited goal came on such a historic night. Zetterberg also had two points on the night, a goal and an assist. It was the second period’s lone goal, which made it 3-0. Gustav Nyquist made a great play to set up the goal. Zetterberg finishes the season with 68 points, besting his totals from the past five years and nearly equaling his 69 point campaign of 2011-12. At 36 years old, he played each of his team’s 82 games for the second straight season (third overall). The win was followed by a “Farewell to the Joe” ceremony, which took place on the ice.